Nandan Nilekani! (Cartoon – courtesy Outlook). The same story applies to the Unique Identity (UID). 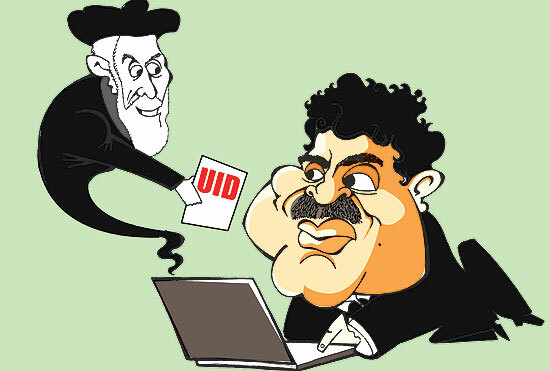 Proposed by Nandan Nilekani, it was the Magic Number our Prime Minister was looking for. In our modern fable , the PM made Nandan Nilekani (tailor) a Cabinet Minister, and gave him a lot of taxpayer’s money (gold), to weave UID (the magic number), that can be only be seen by Govt Authorities (wise people) in India. The purported benefits of UID do not exist, yet every one pretends to see them, as in the fable. This magic number, UID got rebranded as ‘Aadhaar’, meaning foundation, to drive home the importance of the idea of benefits that will flow to the common man in India. The main aim of UID is to collect relevant personal details together with unique biometric information from people and use this information as the basis for issuing unique identification numbers to them. The unique numbers are to be used as the basis of authentication of the identity of Indian residents seeking to avail certain services, either from the State or private parties. Despite all assurances about protection of sensitive information on mass scale, it must be acknowledged that any database that stocks up such personal information brings with it the risk of misuse by various agencies be it public or private, impinging on an individual’s privacy. The Unique Identification Authority of India (UIDAI) does not rule out the possibility of hacking of its data centre and suggested that security should be put in place. Hacking of data is not a theoritical fear , but a practical reality . Collection of data by outsourcing enrolment for UID has huge implications on privacy . Convergence and collation of personal information in a digital form and unrestricted access to such information by the National Intelligence Grid, without any legislated and constitutional safe guards is a grave breach of the right to privacy as enshrined in Article 21 of the Constitution. The non-mandatory nature of implementation of UID , through excessive delegation of powers to sub-registrars under the scheme has both gone beyond the voluntary nature of the scheme, and created greater potential for leakage and misuse of sensitive personal information; without any legislative safeguards. Even UIDAI chief Nandan Nilekani has conceded, on record, that the country needed well-defined privacy laws to prevent any malicious use of data. Regarding the possibility of data being misused, he said that the only service provided by the UIDAI was that of authentication.So, given the lack of privacy laws in India, “convergence” of the UID database with other systems could spell a lot of trouble. As there is no Right to Privacy, this will clearly be an intrusion into the rights of citizens guaranteed under the Constitution. So coming back to our Fable, Mr Nandan Nilekani has so far spent Rs 13,000 crore of Tax Payers money , on this “Magic UID Number” . It is time we stood up like the child in the Fable and tell the Emperor, Our PM, the truth – that UID is neither unique nor beneficial to the citizens of India and that the Government needs to Scrap the UID project, without further delay.